Back on the freeway I noticed that many of the bridges had been retrofitted in anticipation of the next big earthquake. 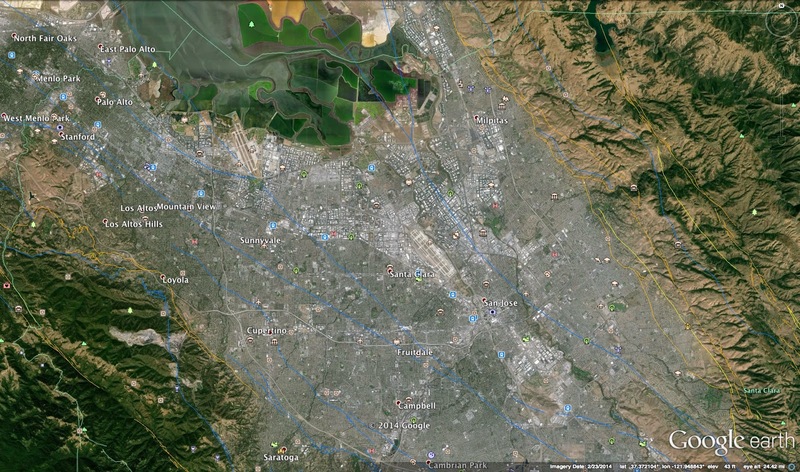 The population of Santa Clara County resides in a central valley between two mountain ranges formed by two fault zones (see Google earth photo below). This makes the area at a high risk for large earthquakes. Driving west on I-280 I photographed the College Drive Pedestrian Overcrossing (37 0322). These types of bridges have skinny single column bents and can be highly excited during earthquakes. A popular retrofit strategy has been to strengthen and stiffen the columns by surrounding them with shear walls. Santa Clara County, California Bridges: College Drive POC across I-280 by Mark Yashinsky is licensed under a Creative Commons Attribution-NonCommercial-NoDerivatives 4.0 International License.